If your child needs to be closely monitored for unusual activity at night you probably suffer from a lack of sleep. I know we did. Alerts you to your child’s abnormal movements with a loud alarm. Does not sound alarms for a child’s normal tossing and turning during sleep. Provides you with a quick way to see and hear what is happening. This allows you to go back to sleep if everything is OK.
Makes recordings that you can share with your doctors. 2: An iPhone, iPod Touch, or iPad running the free SAMi application. A customizable program that searches and analyzes video information for “qualified” events. If an event occurs, an audible alarm sounds on the iPhone or iPod and live video and audio is displayed. The application timestamps and archives recordings from the video camera for later review. 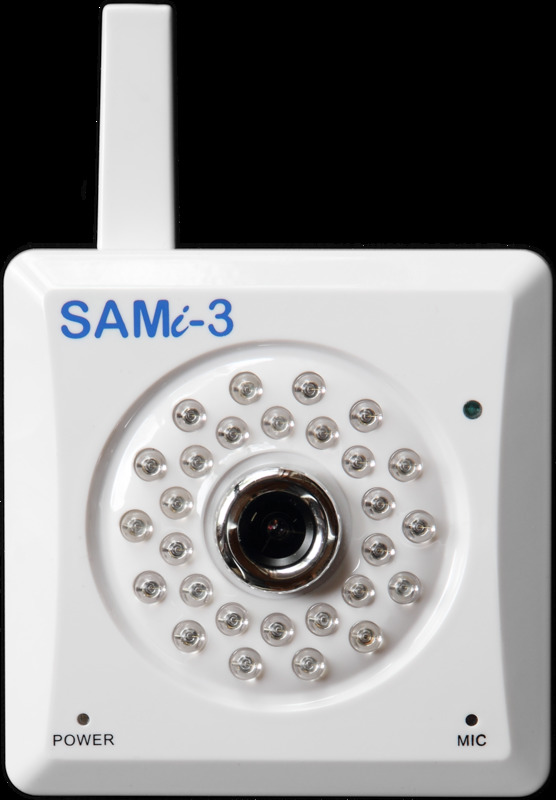 Infrared camera with night-time illuminators – operates in complete darkness. Wall mount attachment point – use with supplied bracket for flexible installation. Optional wired Ethernet connection for maximum reliability and performance. Sophisticated motion sensing – temporal and spatial filtering increases sensitivity and reduces false alarms. Real-time status reporting – alerts you to events and problems. 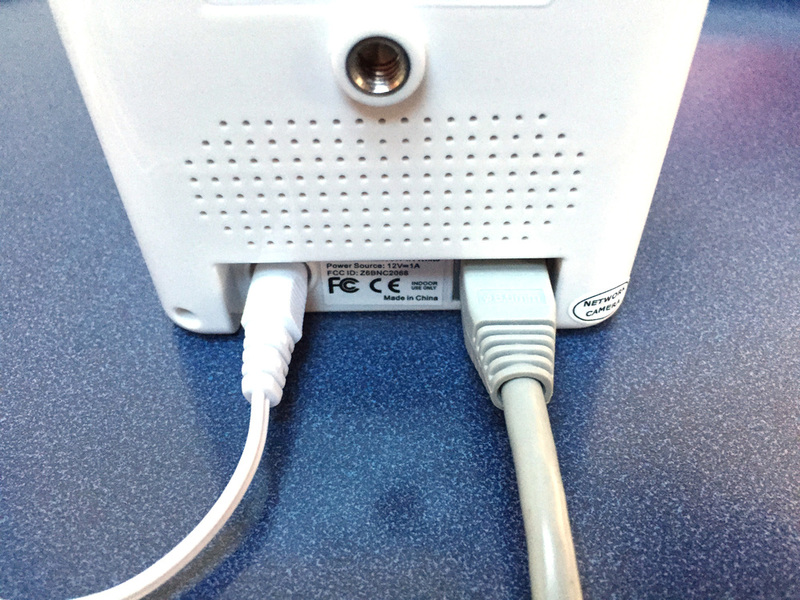 Live video and audio – quickly analyzes whether action is required. Settings page – allows you to fine tune the performance for your needs. You can customize the alarm volume and sensitivity, the display brightness, and the monitoring start and stop times. Clock mode – monitoring continues but live video is disabled for privacy. The display will automatically switch back to live video and audio when the alarm sounds or on command. Recordings log – only motion is recorded and all recordings are stored on the iOS device for easy review. Highlighted alerts – recordings made during an alarm are identified and easily found. Playback controls – allow you to quickly review recordings. 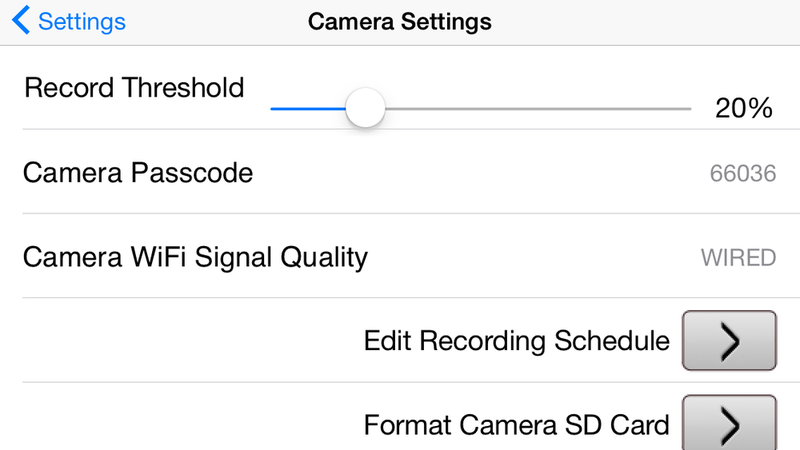 MPEG 4 standard format– recordings are an iPhone-compatible format using MPEG 4 with AAC audio. This format provides for easy and secure transfer to a computer for sharing. Flexible Scheduling – both recording and alarm enable times are individually programmable.